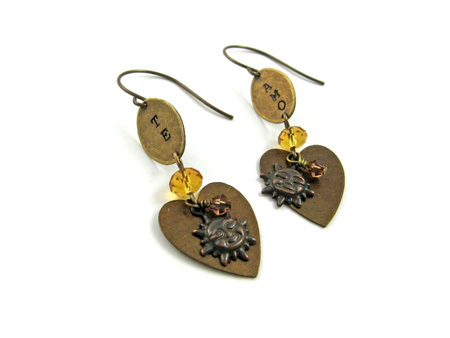 Metal stamping allows you to create personalized jewelry that captures the precise details of your life. You can't find a special necklace with your anniversary date or your cat's name in a big box store, but with a few tools and a little practice, you can make one. Tip: Different metals in different gauges will require different amounts of force. Use a light touch with very soft metals like aluminum and a heavier touch with harder metals like brass. 3. If you'd like your word or phrase to be in a straight line, you can either use a permanent marker to draw a line on the metal blank or you can use painter's tape to mark the line. You can remove the pen line rubbing alcohol and a cotton ball. 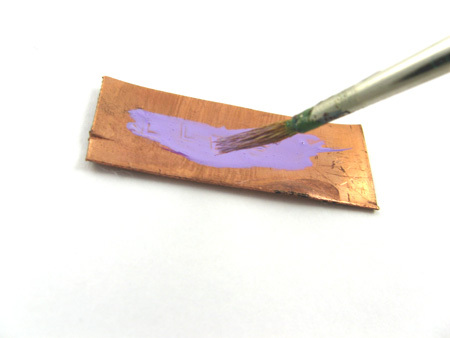 If you're working with altered metals (anything that isn't raw), you'll want to test on the back to make sure that these techniques won't remove the finish. 4. Hold your stamp (letter side down) perpendicular to the metal blank. Make sure that the letter on the bottom of the stamp is facing the correct direction, not sideways or upside down. If you want a word to be centered, start with the letter in the middle and work your way out to the right and left. 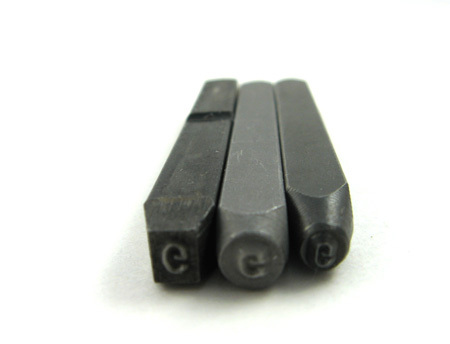 Tip: Some stamps will be marked with a notch, logo, or the stamp letter so that it's easy to tell the letter's direction. Usually these markers are placed where you should put your thumb when holding the stamp. If your stamps do not have markers, consider adding them with little drops of paint. 5. Bring your hammer down firmly with a sold strike on the top of the metal stamp. Tip: It's best to stamp only once. However, you may be able to do a second blow if you do not move the stamp. If you move the stamp to check the impression, you might find it difficult to realign it a second time. This often causes a shadow or double stamped image. Caption: A few sample letters: a. A clean, crisp letter made with just the right amount of force. b. A little light. Make sure you're hammering on a hard surface such as a steel bench block. You also may need to strike the stamp a little harder with your hammer. c. Shows a little of the edge of the stamp (the triangle dent to the upper right). 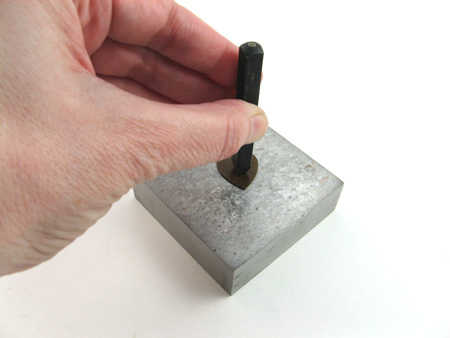 Stamp might be held at an angle or the hammer was used with too much force. d. Shadowy image. This often occurs if the stamp is moved and then hit again. 6. Pick up the next stamp and stamp next to the previous letter. Repeat Steps 4-5 until you've finished the word or phrase. Tip: Know your stamps. Each set (and sometimes individual letters) may differ in how close the letter is to the outside border. This means there isn't a standard rule for how close to hold the stamp next to the previous impression. Also, some letters may not be consistently oriented on the end of the stamp. For example, I have an "R" stamp that if I use it perfectly perpendicular to the metal blank, it will leave a little triangular mark next to the letter. For that stamp, I need to hold it about 5 degrees towards myself to get a perfect impression. You'll also find that you may need to use a softer blow for straight letters like "I" or "L" and a heavier strike for letters with a lot of detail (such as a curly font). Pait over the surface with Vintaj patinas and wipe it off with a paper towel, leaving the color only inside the letters. You need to work quickly, since the patina dries quickly. You can use fine steel wool to remove any dried patina. The How Does Your Garden Grow bracelet uses this technique. Use liver of sulfur to darken the letters. Again, use fine steel wool to remove any extra color. You can also use a permanent marker to color the letters. Use rubbing alcohol to remove the excess color. The Te Amo earrings use this technique. For some metal finishes, such as the chocolate kiss, you can simply use fine steel wool to remove the finish around the letters. The Roger Necklace uses this technique. You may wish to seal your piece to preserve the color. That's it! Now just practice, practice, practice. Every piece you stamp will be better than the last. One last tip: Don't overstress about being perfect. An occasional slightly wonky, crooked letter shows the world that your jewelry was made by hand, not machine. That's always a good thing! Michelle Mach is a jewelry designer, editor, and writer. 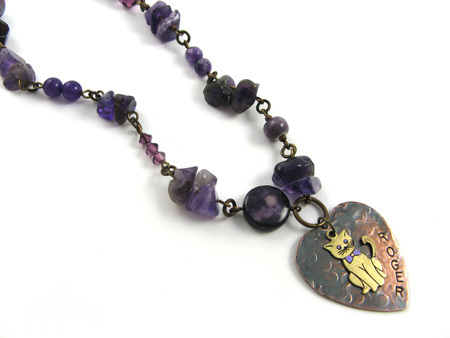 More than 100 of her original jewelry designs have appeared in magazines including Stringing, Creative Jewelry, Easy 0Wire, BeadStyle, Bead Trends, and Beadwork. She loves sharing her creative tips and hosting design challenges. Visit her blog or her Etsy shop.